The newest Android handset is from Sharp and includes both a one-seg TV tuner and IR support for sending/receiving contacts, features that have been noticeably absent from the other Android offerings. It also appears to include another, not-so-nice feature: NAND protection similar to what HTC built into the Desire and Evo, making it impossible (at first) to write to the /system partition, even when using the unix command su (switch user) to execute commands with root privilege. Fortunately for HTC handset owners, by far and away the largest Android hacking community if focused on HTC devices, so it didn't take long at all for the countermeasures employed by HTC to be circumvented. Unfortunately for owners of the IS01/LYNX SH-10B, it is probably going to take a bit longer for this new Sharp handset. The Superuser Permissions app was unable to use su. It works with busybox but busybox cannot be added to the path. They created a tmpfs to obtain root, so it is not persistent through a reboot. I was thinking to post a translation of the directions, but at this point, there is really no need since nothing of use can be done with it, yet. Have you heard that Docomo will be getting the Samsung Galaxy S in Oct? I am stoked I will definitely be buying it. No, I hadn't heard - will check it out. thanks. here is a link http://uk.reuters.com/article/idUKTOE66606M20100707 there are others floating around with videos in Japanese too. Looks pretty nice. Let me how it works out when you get it! I'll write up a little review for you guys when I get my hands on it. I am glad to know that there is some work done in that sense and hope for real openness soon! Perhaps Universal Androot can perform a temporary root? Universal Androot didn't work with AU-IS01. Yo, just wanna say thanks for posting this information so the rest of us in tokyo can see. Nice to know that other people out here are doing this stuff and not only me. So it looks like softbank is getting the HTC Desire... man that thing is pretty nice from the reviews I read. Anyway, I use an IS01 also, got it from the AU campeign where they are giving them away for practically free (if you don't use them). Now the IS03 is gonna come out, I am going to get that one and let the IS01 do what it does well, collect lots of dust. I sat down with AU for a while, they said the IS01 will be getting the update for Eclaire 2.1 late November when the IS03 comes out. The two of those phones will both be getting updated to Froyo 2.2 in Spring of 2011, that's what the AU rep said anyway. I reserved an IS03 for myself, but after looking at the reviews on the Desire.... I might have to wait and see how well the IS03 turns out. Don't need another dust collector, especially one I pay for. Thank you for your inquiry through our website to au E-mail Support Desk. We will answer your inquiry as follows. We are very sorry to say that we could not provide upgrade service for OS version of "IS01". after so many testings and verifications with manufacturer for 5 months. The uprading OS version was under consideration when releasing "IS01" at first time. We are sorry for disappointing loyal customers as you with this matter. We address the full support of "IS01" thoroughly, such as minor upgrade and modifications. Regarding "Skype", we provide "Skype au" service for Android OS smartphone including "IS01". We provide various secured applications on "au one Market". For example, you can use "Skype au" by downloading application from "au one Market." *Downloading involves packet communication charge. We truly apologize again for any inconvenience this may have caused you. We will report your opinion to section in charge of technical improvement. We would be appreciated if you kindly understand this matter. on title of this mail or please do not change the title itself. Galapagos by Sharp is going to past…if LG is launch a dual core smartphone in january…maybe next summer arrive here in Japan….Someone still interesting about Sharp device? 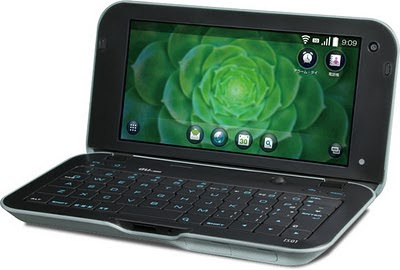 LG Electronics announced the Optimus 2X, which it lauds as the first smartphone in the world with a dual-core processor. The phone comes with a 4-inch screen and 8GB of storage, and is powered by a 1GHz NVIDIA Tegra 2 – previously seen only on new Android tablets – which will give it HDMI mirroring and 1080p HD video playback abilities. The Optimus 2X also packs a microSD card slot, a microUSB port, 8 megapixel rear camera and 1.3 megapixel front-facing camera, and will come with Android 2.2 (with a planned upgrade to 2.3). Planned availability in Korea in January, later in Europe and Asia. In the high-tech rumor mill, HTC supposedly has its own dual-core smartphone, running on a new Qualcomm processor, called the HTC Glacier. Look this..LG device dual core can be run in a HDMI Monitor..cool.